All books MUST BE returned by the posted deadline dates each semester. Deadlines and hours are posted at http://www.fsacollegestore.com. The student will be charged for textbooks not returned by the posted deadline date. 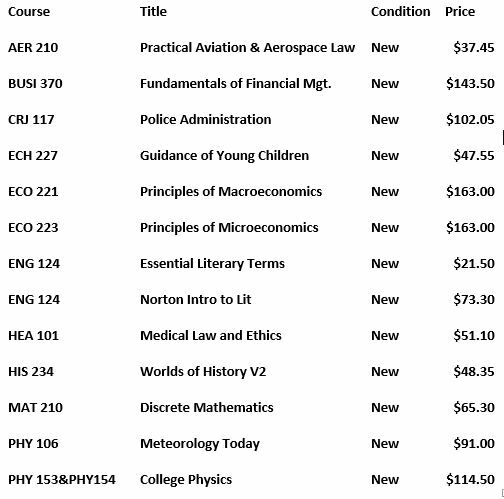 Students will be charged for the replacement cost of the textbooks, plus a $15 processing fee. What do I need to check out and return my textbooks? • An SCCC Student Photo ID is required to check books in and out of the Textbook Rental. A rental fee will be rung up at the register. Fee can be paid by cash, check, charge, or Student Account (Financial Aid). Can I write or highlight in my textbooks? What if it gets damaged. Pages are not missing torn or loose. No excessive writing or highlighting. The College Store reserves the right to refuse any book deemed unsalable. Damage fees may also apply. Can I purchase my textbooks? • You man purchase Rental Textbook at anytime. The College Store staff will assist you in making that purchase. The transaction will be processed as an exchange from a rental to a full price purchase; please be sure to bring the textbook itself, your student ID card and a method of payment. What do I do if I drop or withdraw from a class? • If you drop or withdraw from a course, you STILL MUST RETURN the textbooks to the College Store. Rental Books should be returned immediately after drop or withdrawal. After add/drop period has ended, No refunds will be processed. What if an instructor cancels a book I’m using for my class, can I just keep it? • Please confirm with your instructor the College Store has been notified of the cancellation. The College Store will then supply your instructor with details of how you can return your book. • All books checked out of Textbook Rental must be returned to Textbook Rental. Books can be returned at any time! Refunds may or may not be applicable and will be determined by the College Store. Books that are lost, stolen, or damaged, returned without CDs or other items that were originally with the book, will be billed to you at replacement cost. The prices on your checkout receipt are approximate prices and may not reflect replacement cost of your student textbooks. You may pay for lost or damaged textbooks when you would normally return your books or at any time during the semester. All fines and processing fees are to paid in the College Store. What if I cannot return the rental book by the appointed deadline? • If an emergency arises that will prevent you from returning your rental on time, contact the College Store prior to the rental deadline. The College Store handles such things on a case by case basis. • You are still responsible for returning the rental book by the rental deadline even if your final exam occurs after the rental deadline.